A Senate group on Tuesday oversaw a hearing on the role played by the People's Republic of China in the deadly surge of fentanyl flowing into the United States. "As we all know, and as I anticipate the witnesses will tell us again here today, China is the number one problem when it comes to illegal fentanyl coming into the United States," said Caucus on International Narcotics Control Chairman Chuck Grassley (R., Iowa) in his prepared remarks. Of the over 70,000 drug-overdose deaths in 2017, more than 40 percent involved synthetic opioids, predominantly the painkiller fentanyl and its analogs. These drugs are bulk-produced in factories in southeast Asia, then smuggled into the United States either across the southwestern border in coordination with Mexican cartels or through the U.S. Postal Service. Numerous national and international law enforcement agencies, including the DEA, have identified China as the primary source of illicit fentanyl entering the United States. This is in large part because, as American Enterprise Institute scholar Derek Scissors noted in his testimony, China is central to the prescription drug supply chain, serving as the world's largest producer of a number of pharmaceuticals. The government has sought to expand this position in recent years in response to China's massive, and now rapidly greying, population. This massive drug-production infrastructure combines with a lax regulatory regime to make China the perfect site for drug mass production. "The Chinese government has a fragmented regulatory framework. 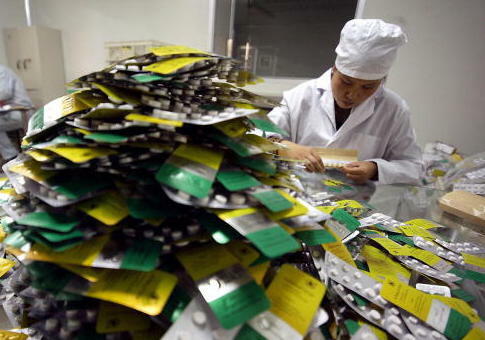 Oversight of China's pharmaceutical industry is spread across many different ministries, commissions, and agencies at the national, provincial, and local levels," noted caucus co-chairman Sen. Dianne Feinstein (D., Calif.). Speaking to the caucus, representatives of the DEA, ICE's Homeland Security Investigations, and the drug enforcement arms of the State Department and Food and Drug Administrations outlined the efforts their agencies had made to curb the flow of illicit drugs into the United States. Work in the past several years has led to the arrest of Chinese nationals by Chinese police on drug charges, as well as the scheduling of 175 fentanyl analogs and two key precursors. "We have seen that any time they control … substances, that has an immediate impact on the availability of substances that are submitted to our forensic laboratories for analysis," said Paul E. Knierem, Deputy Chief of Operations for the DEA's Office of Global Enforcement. While in the past several years there has seen significant progress in inducing the Chinese government to crack down, senators and law enforcement officers alike voiced the opinion that they could be going substantially farther. As both Feinstein and Scissors mentioned, China clearly has the law enforcement capacity to bring far greater brute force down on drug dealers, but has thus far opted not to do so. Much of the explanation for this reticence comes down to how the Chinese—and, in point of fact, the government of Mexico—views America's current drug crisis. Both governments have insinuated that the drug crisis is primarily the fault of the United States for not sufficiently curbing demand among users, a line reminiscent of the one taken by the British 150 years ago, during China's 19th century opium crises. "They consider this to be an American problem, because of the demand, not a Mexican problem," Sen. John Cornyn (R., Texas) noted of the Mexican government. "Even though 90 percent of the heroin is grown and produced in Mexico." This attitude, that the problem is ultimately of America's making, is of vital importance to the ruling Communist party clique. If they admit fault on the issue, internal critics of the CPC could use it as leverage to argue that the ruling party was failing in some way, thus fomenting the sort of dissent the government tends to crack down on brutally. "One of the reasons they don't want to acknowledge their role is because acknowledging their role opens up Pandora's box domestically," he said. The consequences of this reticence are significant. The Chinese government continues to refuse to extradite the Chinese nationals who have been indicted by the Department of Justice over the past year in connection with fentanyl overdose deaths in the United States. And while the government has restricted a number of important fentanyl precursors, it insists on taking into account the demand situation in the requesting country in making further scheduling decisions, according to State Department official Kirsten D. Madison. The caucus chairman, Grassley, is the Senate sponsor of a bill aimed at expanding law enforcement's power to combat the flow of synthetic drugs, the Stop the Importation and Trafficking of Synthetic Analogues (SITSA) Act. If enacted, the bill would add a new schedule to the Controlled Substances Act specifically for analog drugs. It would also schedule 13 fentanyl analogs under the CSA, making it easier for the DEA and other law enforcement to target them. This entry was posted in Issues and tagged China, Drugs, Opioids. Bookmark the permalink.